I felt it was only right to start a new thread on the fitting procedure of this gear box transaxle and afn tdi into the back of a VW T3 Vanagon. Take the engine and gear box from either the Audi A4 or the VW Passat TDI with the inline engine and fit the whole lot into the back of any VW T3. So what I set about building was an adaptor plate that allows the gear box to be flipped upside down to then give the 5 or 6 forward gears and one reverse. It really is that simple. 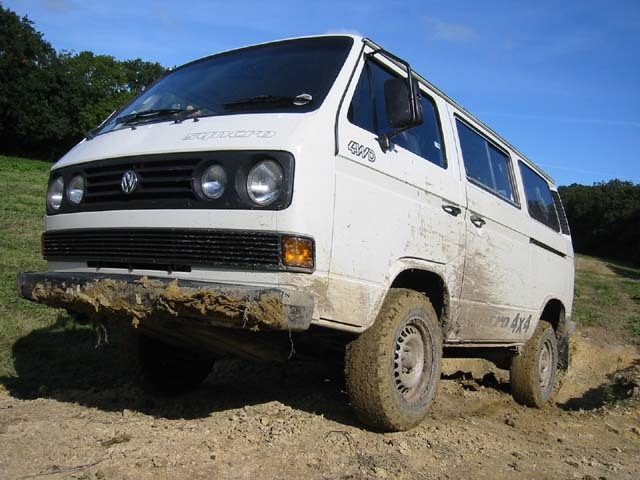 The idea then is to use some of the fitting parts used by VW to install the diesel td engine into the VW T3 Vanagon. These parts would be the usual suspects inc, turbo diesel sump, water pipes, dip stick etc etc, but to maintain the flywheel, clutch, starter motor,gearbox input shaft from the donor car, thus saving a huge amount of cash on bespoke parts and rebuilding an inherently weak standard VW T3 transmission. Up until now I have been using the very reliable Renaul t UN1 trans axle with my TDI conversions. The downside to using this box is its physical size. It is longer than the standard VW transporter gear box and means that you need to cut and modify the cross members under the van if you want to keep the engine in its stock location. The A4 Passat box on the other hand is short enough to fit into the unmodified body of the bus. Also this gear box has been chosen by VW to work with their AFN (110 bhp) engines and also the PD engines which are rated to 150 bhp. This should give a reasonable amount of reliability with this gear box. The goal at the end of this project is to supply parts or a complete fitting kit to allow T3 owners to convert their vehicles from either petrol or diesel to TDI. Also if this is successful I plant to produce a fitting kit to allow the use of the PD engine range into VW T1 split screen, T2 bay window, T3 T3. I can take no credit for the idea of using the inverted gearbox as Martyn (bus boy) has one in his van which I believe he bought pre modified and extensively tested by a T2 owner. This box has a cut and welded bell housing which although works, might not have the degree of accuracy that is available from my CNC machined adaptor plate. So here is the beginning of the project. The engine fitted with the adaptor plate with the inverted gear box attached. Came across this useful list for transaxle codes. Might help with people who want to mix and match engine and gear box combo's. Very interesting, will this, or does this, work with 2E/AGG/ADY petrol motors? It would be a good alternative gearbox for those who have already "modernised" their T3. sooo would this work with any 2 wheel drive a4/passat combo? petrol variants always seem a whole lot cheaper. Tim, great to see the investment being put into providing the T3 community with another option for keeping our vans on the road. Is this for i4 @ ~50 degrees only ? It'd be great to have the option of i5/v6 motors as well. Also, I think the later TDI lend themselves more to 15 degree installs, what with their different turbo's, sumps and engine bracket tappings. TBH with the scarcity of T3 TD bits (in some parts anyway) there's an argument for doing even earlier i4's at 15 degrees. Edit: What are the starter/FW options ? I guess with the 5sp starter a notch may be needed as the original pocket is on the other side ? Perhaps the 6sp starter lacking a nose avoids making a notch ? The plan for the moment is to put together the in line 4 over at 50 degrees. The engine to gear box issue is now sorted and I now need to turn my attention toward building the engine and gear box mounts and sorting out the gear linkage. As for the 5 and 6 cylinder models this should be straight forward. Just a case of rotating the fitting holes 180 degrees. Although the PD in line 4 cylinder uses a different set of holes to the 5 and 6 cylinder the arrangement with rotating 180 will be the same. Just need to check which gear box fitting holes clash with engine fitting holes. Making the plate will be a piece of cake. door hinge pin mod....... whos up for doing it then? I am installing the package into a bus while we speak and should be doing my first install in a few weeks for a customer with his AFN tdi conversion. I'll let you know how I get on. Any updates on the conversion - I'm sure there are plenty of us on here keen to know how progress is going. As the job involves all of the usual work involved in a TDI conversion, I will have to do that part of the install before I can continue with the rest of the conversion. I have been collecting parts and prototyping the gear linkage and engine mountings. Cheers for that Tim, I look forward to your next update and hopefully some pics as well. You just hit your finger with a hammer ? don't be silly mart, he's from bristol like you lot.. more thumbs than fingers down there.. It's a long story. Lets just say I was just one step behind the curve. 2-1 says you got 5 reverse and 1 forward gear! I have just spent a fair few ££ getting a very good convestion in me van. Now there is a new way. Bah!